If you currently sell (or would like to sell) prints of your best work here’s a technique I’ve used successfully to assure buyers that if they resell my photographs some day it can be proven that they are genuinely mine and not unauthorized copies. I began doing this a few years ago when a friend who sells prints at art shows and fairs in this country traveled overseas and found copies of his work being sold there. He quickly realized that someone had taken photos of the images displayed at his booth, had reproduced them and was profiting from his work. While he couldn’t do anything about those pictures, he now has a sign at his booth that prohibits photography– rather ironic in a sense. He also issues a Certificate of Authenticity (COA) with each print, though he admits this can’t stop people from buying knock-offs. It can, however, assure buyers that you are doing everything possible to protect their investment should they ever need to prove the image’s provenance. A picture sold with a COA also adds to its perceived value and you may be able to get more for an image with one than for one without; it’s a very strong selling point since many people buy photographs with the anticipation that they might become more valuable in the future. Over the years I’ve improved the format of my COA (which began as just a few lines and a signature). I now give the buyer some insights into how the images were shot and printed. I’ve found that this expanded, back-story gives the photograph (and the photographer) some “personality” and buyers are delighted to get this value-added item. Some have told me that they’ve displayed the COA along with the image though I think that’s a bit much. I’ve also tightened the security aspects of the COA so that it is now much more difficult to forge the Certificate itself. Together with signing the back of the print in pencil (traditional) together with the date and edition number (which is also on the COA), it assures that both are tied together. I’ve also incorporated wording within the text stating that the COA must have a seal embossed over my signature. This adds a element that cannot easily be duplicated and the certificate becomes invalid without it. You can have a seal made inexpensively (with your own wording) at local office supply stores or at many sites on the web. Just make sure it is metal and not plastic as metal embosses much better. Now bear in mind that any security system can be breached if enough time and money is spent to do so. The point of a COA is that in the art market, which is very wary of fraud, should the print appreciate in value, legitimate owners would have prints with COAs which they could use to prove that their images are authentic. I usually print my COAs out on a cream Parchment surface paper (available in office supply stores) which gives them a very professional and upscale look. I also sign them in colored ink which makes unauthorized duplication more difficult. Since most photographers don’t go to the trouble of including COA’s you may be surprised at the positive reaction of your buyers when you include one with each print. It’s a nice touch that gives you a marketing edge on the competition. Following is an example of the COA I currently use. You can do your own it in Word with a simple table of two rows and two columns and add or delete any items to customize it. Under the COA you will find text that you can copy and paste, along with some explanations. CAPTURE MEDIUM: Digital Image or Film Image INK: Such as Epson Claria or whatever the ink. These comments can be as long or short as you wish. 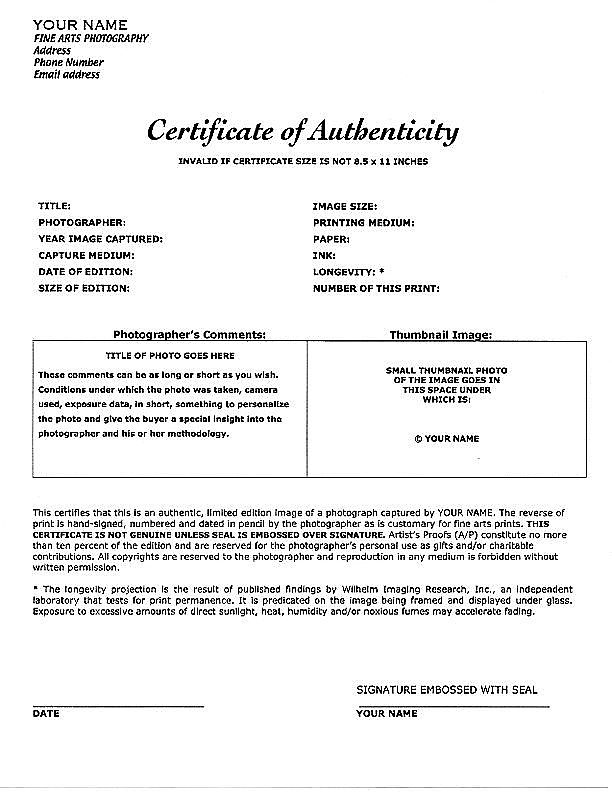 Conditions under which the photo was taken, camera used, exposure data, in short, something to personalize the photo and give the buyer a special insight into the photographer and his or her methodology. This certifies that this is an authentic, limited edition image of a photograph captured by [Your Name]. The reverse of print is hand-signed, numbered and dated in pencil by the photographer as is customary for fine arts prints. THIS CERTIFICATE IS NOT GENUINE UNLESS SEAL IS EMBOSSED OVER SIGNATURE. Artist’s Proofs (A/P) constitute no more than ten percent of the edition and are reserved for the photographer’s personal use as gifts and/or charitable contributions. All copyrights are reserved to the photographer and reproduction in any medium is forbidden without written permission. NOTE 1: The Artist’s Proof sentence assures the buyer that no more than 10% of the edition will consist of un-numbered images. So in a limited edition of 30, only 3 additional prints will be made. In the field “Number Of This Print” put A/P if it is an Artist’s Proof. NOTE 2: Include the paragraph below only if you have a longevity rating, If not, remove it (and the Longevity field) from the COA. * The longevity projection is the result of published findings by Wilhelm Imaging Research, Inc., an independent laboratory that tests for print permanence. It is predicated on the image being framed and displayed under glass. Exposure to excessive amounts of direct sunlight, heat, humidity and/or noxious fumes may accelerate fading. Selling Images? Print Them Yourself For Best Results! Your Images Pirated? Here’s How To Get Paid For Them! Good post. AND if you’re using a “Notary” type seal, it is as good as a hologram that another company offers at a premium. This article was very helpful, but now that I have purchased your Palo Etching paper, how do I get a longevity rating. Epson Velvet paper is rated 82 yers with Epson Ultra Chrome K3 ink. Should I assume it is the same? The short answer is yes. Fade resistance is heavily dependent on the ink you use. UltraChrome K3 is thankfully a stable ink that makes prints that look good for decades. Palo Duro Etching is, like Epson VFA, a museum grade paper that facilitates long term fade resistance. 80+ years on display (under glass or arcylic) is very likely. Thanks for the idea- it will help a lot. How does one go about getting a rating for the prints? Isn’t the rating with the RedRiver paper we buy? Longevity ratings are done by independent labs for ink and paper combinations. Ink manufacturers usually pay for these tests as it is the ink that is the key element in longevity. You usually will find how long an ink is projected to last before fading in the ink manufacturer’s specs. If you can’t find a rating, just eliminate that field and the reference to it in the COA text.